BREAD-AND-BUTTER issues were topmost on the minds of participants at this year's Pre-University Seminar yesterday. More than half - 53 per cent - of the 500 teenage students attending this year's edition of the annual event cited fears of unemployment and a potential economic recession as their biggest worries, trumping concerns over, for example, war and climate change. The 53 per cent figure emerged at the close of Deputy Prime Minister Teo Chee Hean's three-hour keynote address to them, during which technology figured hugely. In a departure from a traditional speech, he turned his talk into a lively interactive session by inviting his young, tech-savvy audience to respond to questions he lobbed at them. As he made his points, he asked them about their aspirations and what they thought about Singapore's future, and they responded using their smartphones; the results of each poll flashed in real time on the screen behind him. The students, hailing from polytechnics, junior colleges, Millennia Institute and Integrated Programme schools, will spend the next three days meeting political, community and industry leaders to discuss issues key to the future of Singapore. 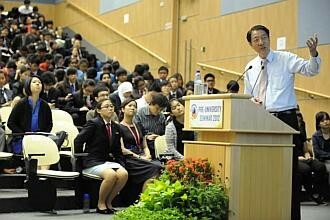 Organised by the Ministry of Education and Millennia Institute, the seminar opened on Monday and is held at Nanyang Technological University (NTU). Over 62 per cent of the students said they were optimistic about their future; 52 per cent said they were optimistic about their future here. Mr Teo also flashed the responses that their peers had given to questions asked on social networking site Facebook in the run-up to the seminar. Speaking to reporters later, he said he asked the questions on optimism because he wanted them to 'discover for themselves that life is not an escalator; you actually have to work to make your country better, you have to work hard to make your life better'. When it was the students' turn to quiz him, they did not hold back. In a session that overran its allotted time by an hour, they asked him questions that went beyond immediate material concerns to issues such as that of developing a sense of belonging to Singapore, the income divide and press freedom. Mr Teo said he was happy with how the session went, and that he had seen the students' 'heart for Singapore'. St Andrew's Junior College student Wong Cheng Yin, 17, felt the dialogue was an eye-opener.